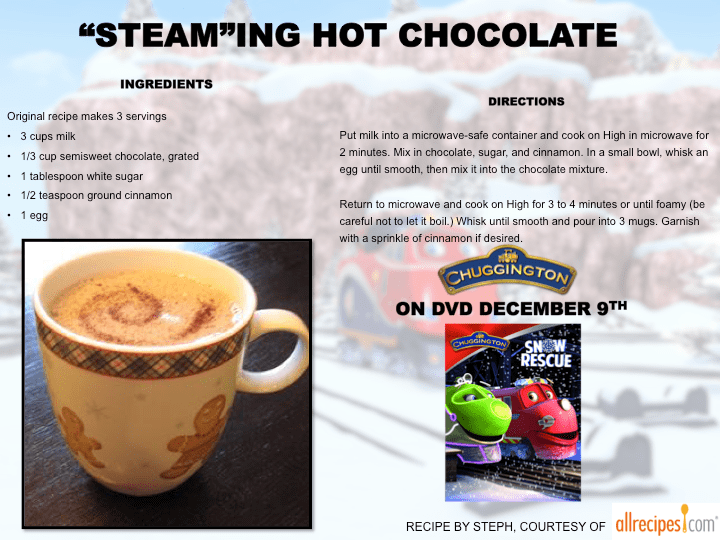 Chugging to DVD December 9th is Chuggington: Snow Rescue just in time for the snow and the holidays! In this action-packed collection featuring new character montages, the complete Snow Rescue Special and more the trainees work together for big winter fun and adventure! It’s winter time in Chuggington and the Chuggers make special preparations for the magical Winter Parade, outfitting themselves in glowing colored lights for a special nighttime processional through town. But when freezing fog traps Koko and a snowy avalanche derails Fletch, Wilson and the Chug Patrol must set out on a wild winter rescue! Your own little Chugger will discover important lessons about safety, responsibility, and teamwork in this and four other special episodes showcasing the latest adventures in Chuggington! 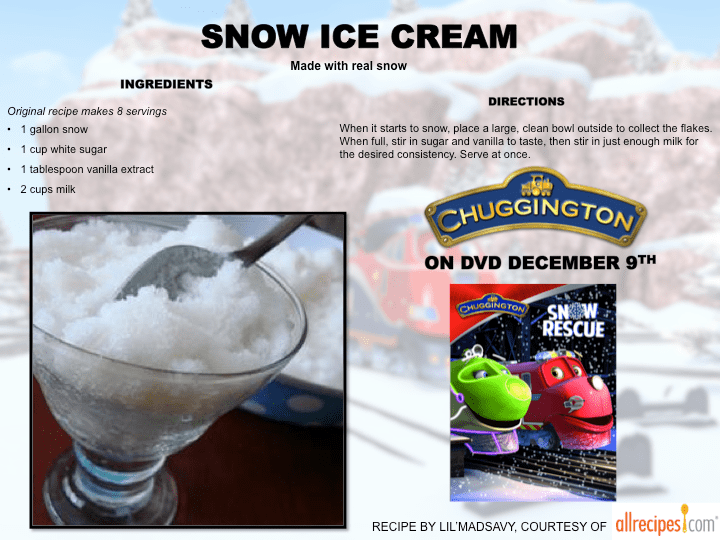 Really bring home the wonderful world of Chuggington with these yummy free holiday recipes that everyone can enjoy! Click the image below to download all 4 recipes. These are free to download and print. Add them to your recipe book to use them year after year. You can also check out the recipes and select which recipes you would like to download. However, I think you will find all of these deserve a special place in your cookbooks! 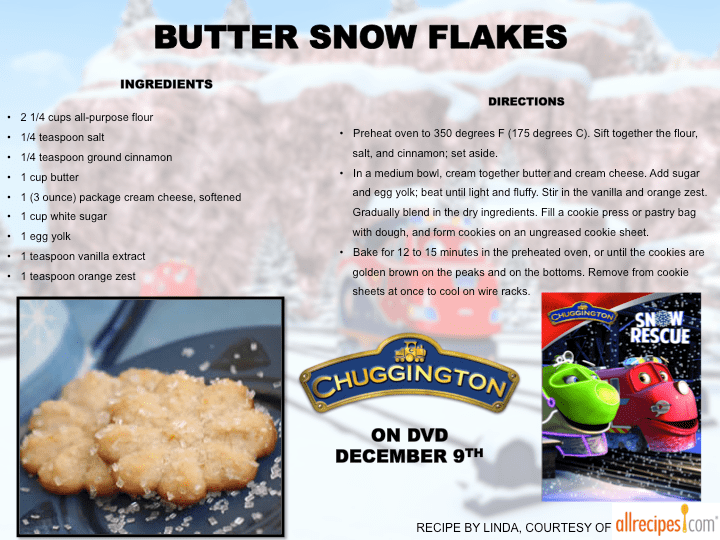 Bring the snow inside this holiday with Butter Snow Flake cookies! These snowflakes melt in your mouth not in your hand! With just a few simple ingredients bring warmth in from the cold and transform the holiday! Fletch from Chuggington: Snow Rescue is sure to approve of these cookies if he can ever get rescued from the large avalanche and hs time to enjoy a batch or two. All that fluffiness outside falling to the ground isn’t just a white blanket covering the ground. Place a clean bowl outside and catch a lot of the snow to make some snow ice cream. This recipe doesn’t even require an ice cream machine! Add sugar, vanilla and milk and serve immediately! Winter becomes a sweet sensation with servings of Snow Ice Cream! If Koko can find a way through the freezing Fog, I am sure he would enjoy a yummy batch! After a day of rescue or play, sometimes the only thing to warm up our bodies is a nice cup of Hot Chocolate. Perhaps Koko and Fletch would like a cup if they get rescued from their snowy situations. 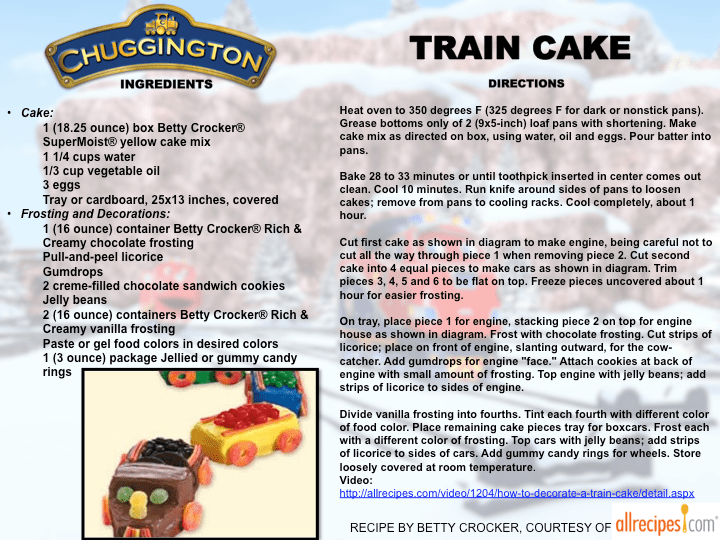 Bring the Chuggingtons to life by making a Train cake! Enact the rescue scenes or simply decorate them any way you wish like a gingerbread house. Whatever the case these delicious cakes will bring a smile to all those eating it. While some of these recipes are cooking, you and your loved ones can spend time coloring these free coloring pages featuring characters from Chuggington: Snow Rescue! Click the image to see my other blog post and download the free pages!